Corporate awards build credibility by reinforcing a company’s stated values and marketing claims. The Incap team has worked very hard with its partner to develop the best dispensing cap and provide quality of service over the past years. Our employees are very motivated, dedicated and loyal. We are very proud of our team members who achieve these awards. 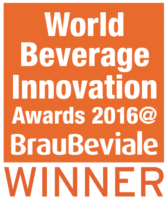 World Beverage Innovation - Best Packaging 2016. The finalists in all 26 categories of the World Beverage Innovation Awards 2016 have been announced. Now in its 14th successful year, the awards are designed to celebrate excellence and innovation across every category of the global beverage industry. This year, 229 entries from 37 different countries competed in 26 categories. Overall winners from each of the categories will be announced at the awards ceremony, to be held on 9 November during BrauBeviale in Germany. The finalists in all 26 categories of the World Beverage Innovation Awards 2016 have been announced. Now in its 14th successful year, the awards are designed to celebrate excellence and innovation across every category of the global beverage industry.This year, 229 entries from 37 different countries competed in 26 categories. Overall winners from each of the categories will be announced at the awards ceremony, to be held on 9 November during BrauBeviale in Germany.